I told you that we were getting into the Halloween spirit. We even went out this weekend looking for Halloween decorations for the house. This is our first Halloween in our new neighborhood and while there aren't a lot of kids in our little cul-de-sac, I still want our house to look scary because the kids in the neighborhood do come out for trick or treat, well according to our new neighbors. Costumes have been purchased and it seems like the costumes get more expensive every year. My toddler still don't want to "let it go" so she's going to be one of the princesses from Frozen. You'll get to see her on Halloween because we'll be on Instagram. If you're not following us I would recommend doing so. 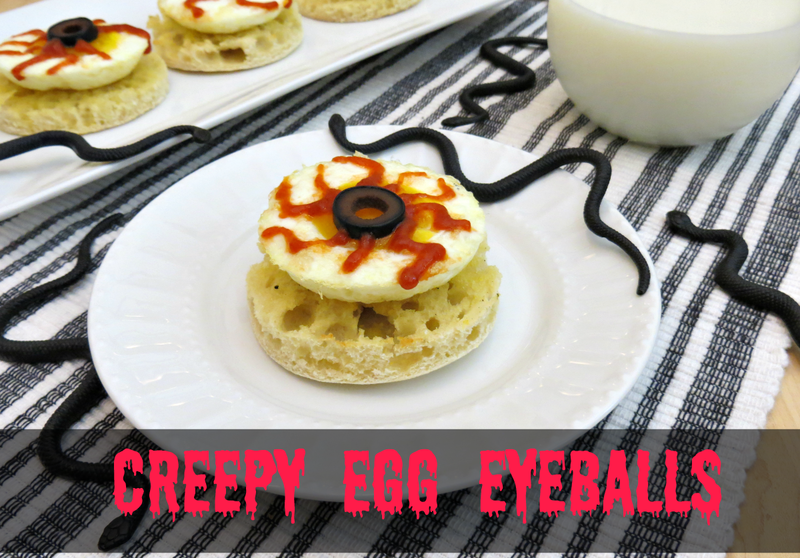 Well before we get carried away about Halloween let me share with you today our very own Creepy Egg Eyeballs, which is a hit at breakfast. The kids thought that this was eerily creepy but they loved it and your kids would have a blast making it as well. Liberally spray a muffin top baking pan with non-stick cooking spray. Lightly toast the English muffins and butter them, if desired. Set aside. To bake the eggs, carefully crack each one into a small dish and ten gently slide into the prepared pan. This recipe is for four, but I always do a couple extra in case one breaks (as you can see in the picture). 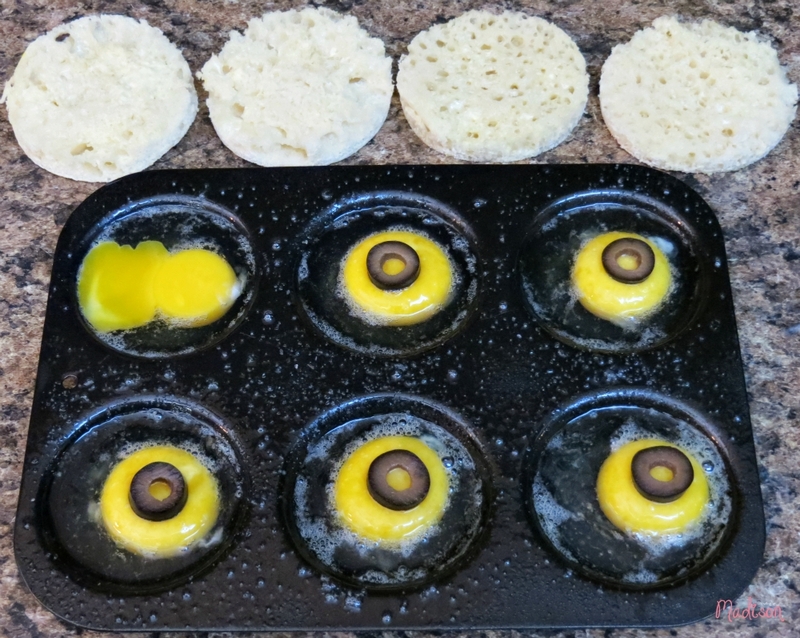 Place a black olive slice in the center of each yolk. Sprinkle the eggs with salt and pepper and bake for 7-10 minutes or until the whites of the egg are completely set. Check after 5 minutes. 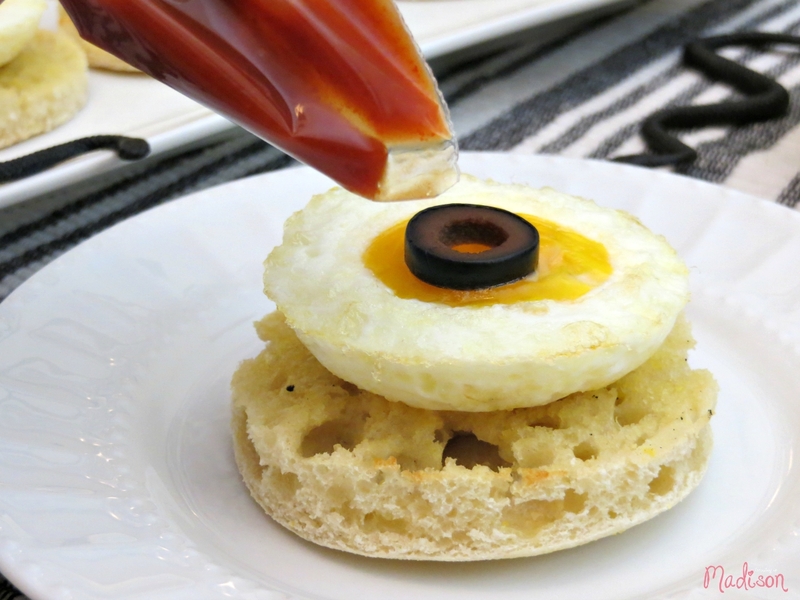 Remove from the oven and place one egg on top of each English muffin. To make the "veins" of the eyeballs, you can use Sriracha or ketchup. Pour about 1/2 cup into a baggie and work it down into one corner. Snip off the very end of the baggie and carefully squeeze into cooked lines from the yolk of the egg to the outer edge - to mimic the veins in an eyeball. Continue going around until it looks the way you like. Serve immediately so the egg doesn't get too cold! It's important to use small eggs. Large eggs were too big for the muffin top tins and overflowed. Those are creepy cool! My boys would LOVE those. What a great idea. My kids will be so surprised to see this at breakfast tomorrow. These are so fun! My kids would have loved if I had made some creepy food like this. Great way to get the kiddos to eat breakfast! I love these. Oh my goodness, are these ever cool Amanda! Oh wow, not only are these probably yummy but how cool are they for Halloween time??? Oh these are totally cool. They'd be so fun to surprise the kids with for a Halloween meal. These are so cute and very creative and different. I bet kids love these. 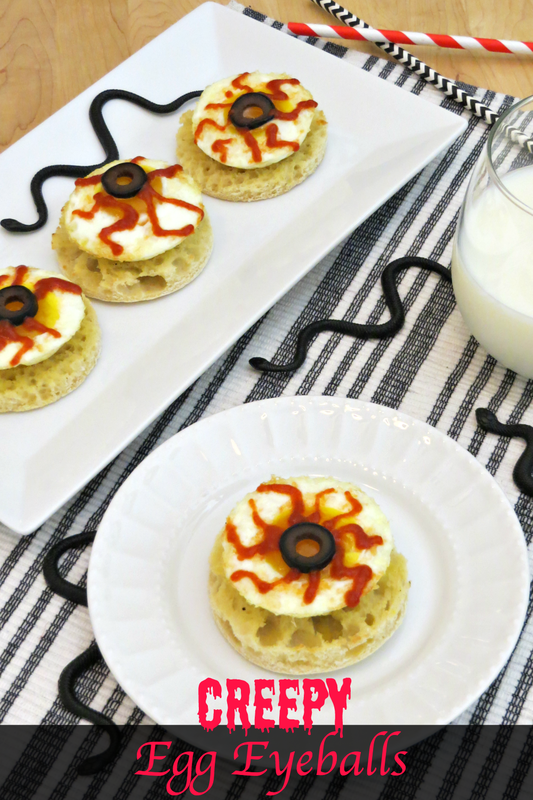 I might have to make these for breakfast on Halloween. I love these. I will have to try making these for the kids. I think they will enjoy them. They look so delicious. This has got to be the cutest thing I have ever seen! It would sure get my kids to eat breakfast! These are just too adorable. My kids would love them. These are definitely creepy and perfect for Halloween. They would be so much fun for a themed Halloween party. Such a great idea which is very much creative as well. This could be one of those best ways to make your kids eat something with more interest & fun. The pictures tell you how super delicious the recipe is. I am thoroughly impressed with this. Not only does it look delicious (I'm such a salty breakfast person and I love olives), but you pulled it off flawlessly.